It is the brandy syrup saturating the cake that does the trick! 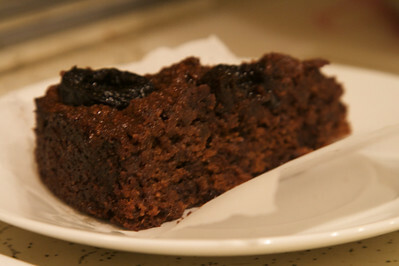 The cake tastes way better than it looks – very plummy and full of molten chocolate. And the addition of liqueur, in our case Calvados, makes its aroma richer and the taste more voluptuous than you would think from the small amount of fat in it. 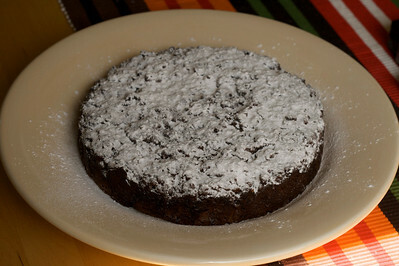 Thank you Clotilde, it is one of the best chocolate cakes we have eaten yet. Ad Hoc can try this one out instead of the ho-hum brownies that they chose to serve us after their not-so-good ribs.